Pop-up urbanism, or tactical urbanism as it’s sometimes called, seems like an idea that belongs to our era. Most urbanists haven’t heard of Bonnie Ora Sherk. Most people capitalizing off of the resurgence of pop-up architecture probably haven’t heard of her either, but she is actually one of the pioneers of “tactical urbanism,” “spontaneous interventions,” and the other forms of unsanctioned public space activity that are extremely important in today’s discourse over how public space is used and allocated. 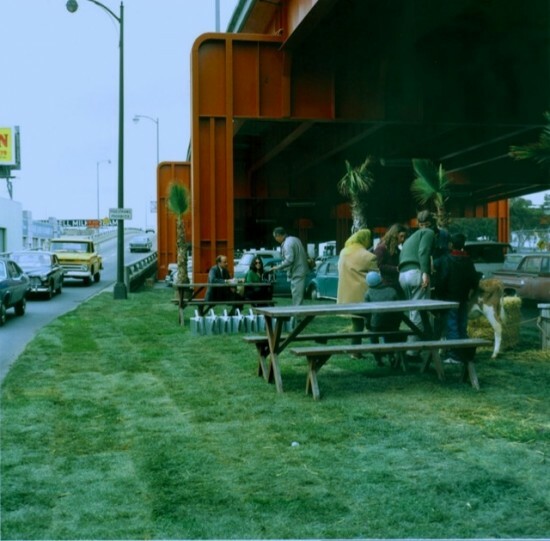 Her interventions, titled “Portable Architecture,” began in 1970 by essentially doing what’s now known as Park(ing) Day around strategic points in San Francisco. This incredibly prescient intervention foreshadowed a theme in urbanism that would gain widespread support 30 years later: the culture of DIY, combined with place-making in city streets. Ms. Ora Sherk’s original Portable Architecture installations revealed the potential for artists, and public art, to inspire improvements to infrastructure, but they also revealed the weakness in not skillfully connecting public art projects with how public space plans are developed and implemented. Elsewhere on the Network today: This Big City reports on how cities are preparing to cope with the effects of climate change. Orphan Road outlines how to build coalitions for dense, transit-oriented developments. And World Streets says that bicycling organizations that overlook “invisible cyclists” risk losing political support. The Pay Toilet: Coming Soon to a Street Corner Near You?